Duplo`s iSaddle Family is the only relevant Saddle stitching option in today’s market. The iSaddle family offers a wealth of features that allows commercial and digital printers to grow and improve probability of their business. Unlike with the old-generation saddle stitchers, so many of today’s automated saddle stitchers produce booklets that don’t remain flat. With the Duplo iSaddle you get the best of both worlds – flatter publications with all the time-saving and quick changeover you would expect from an automated system. And you can expand your application options with A4 landscape format work. Included in the range is the iSaddle PRO, equipped with the high speed DSF-6000 sheet feeder, capable of 600 sheets per minute. We believe that our customers deserve more than just a great piece of equipment. That’s why when you choose to work with Neopost you get so much more. Whether it’s a new binder, booklet-maker, folder, guillotine or any other solution from our extensive range of graphics equipment, you can be sure it comes with an exceptional level of support. You see, we believe that if you are a happy customer, you’re a loyal customer. We know that offering you the best service in the business is good for business. We know that our success depends on keeping you satisfied. That’s why we’re committed to providing you with an outstanding level of service each and every time. Guaranteed! The iSaddle has been engineered to provide the latest technology to allow for the built-in features to maximise output. 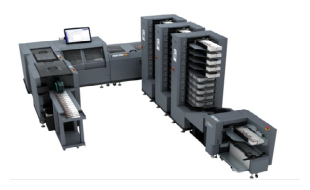 It can finish up to 4,500 books per hour without operator intervention or any wawww. The high speed and intelligent DSC-10/60i suction towers deliver superior performance whilst maintaining complete accuracy. Each tower of 10 bins comes with A.M.S.+ (Air Management System Plus) as standard. The iSaddle 2 is highly versatile and modular saddle system that can be re-configured and expanded as needs and demands change. Interested in hearing from Neopost Graphics from time to time on the latest news, offers, and advice?